Is getting the most money quickly from selling your house important to you? The two key factors to achieve this is Effective Marketing of your property and Targeting the Correct Buyers for your property. 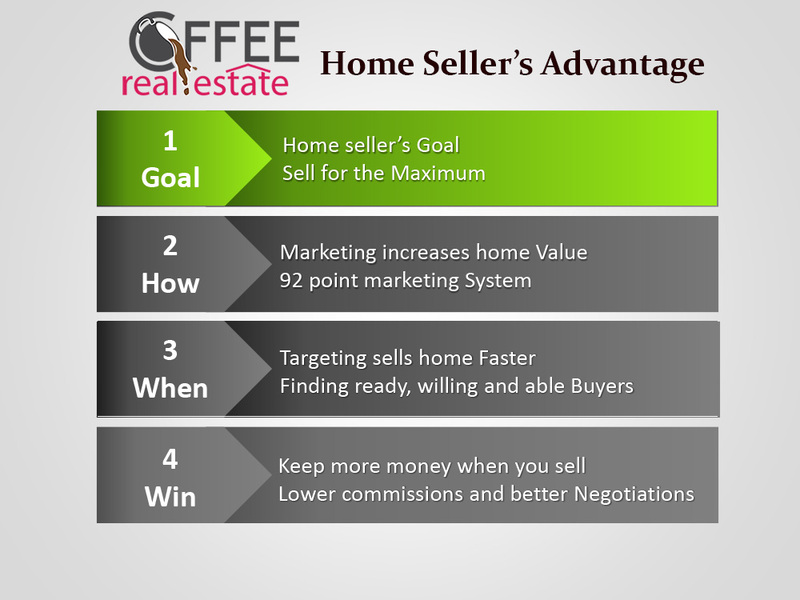 Step one in Coffee Real Estate home seller’s advantage is what is your goal in selling the property? We listen first. We want to know what you want. Then we create an effective marketing plan to achieve your goals. The discount brokers and low commission websites have a cookie cutter marketing system that you must fit into. Like step 1 address, step 2 upload photos, step 3 price, click start to sell your house. Or the standard realtor’s 3 steps – 1- put up sign, 2- put on MLS, step 3-hope someone comes along and makes an offer. We design an effective marketing plan to sell your house for your goals. If you want to sell your house for above market value - we create that type of marketing plan. If you want to sell it by the weekend than we design that marketing plan – very quickly. Coffee Real Estate’s 92-point marketing plan gives us the marketing tools to achieve your goals. Our marketing and real estate experience provides us the ability to choose the correct marketing methods to reach your goal. 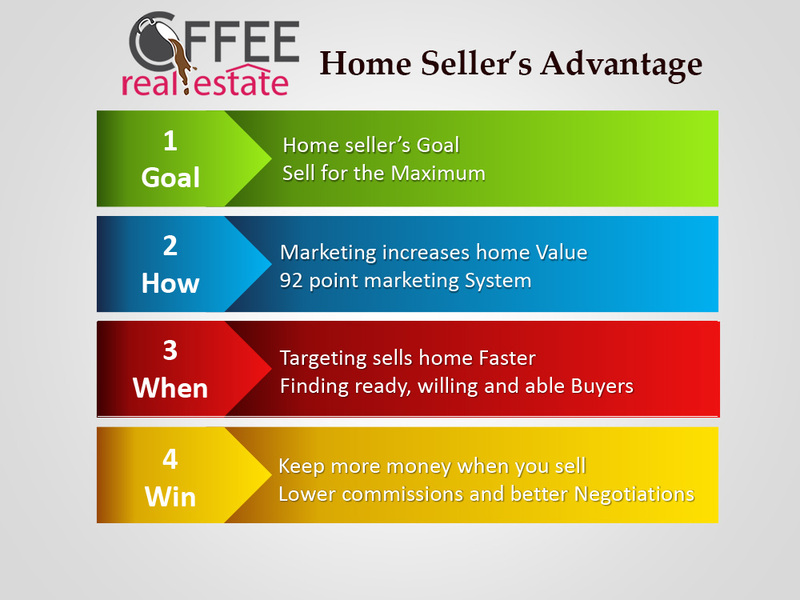 Step 2 in Coffee Real Estate’s home seller’s advantage is building the worth in your property. Coffee Real Estate builds value in your property with a strong marketing story and call to action. We want home buyers to hear how great your home. By showing the prospective buyers the worth of your property, they would be willing to pay over appraised value. We can also show a strong value and why they must move quickly to get a one of a kind deal. Building value in your property begins with understanding the best features and benefits for buyers. The key to realizing the highest price is to design a story about your house that showcases its worth. Writing a powerful description communicates the value of the home. It creates emotion as well as the benefits about the property. Also, part of the 92 point marketing system is utilizing the best images to demonstrate the property’s appeal. Together the photos and story enhance the value of your home. Marketing is about creating value for your property. Let’s see how we can create value with your property. 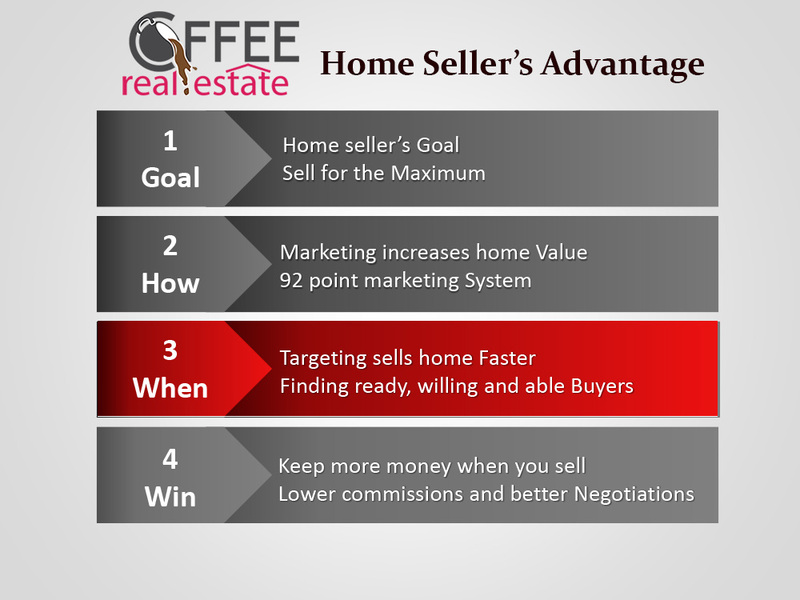 Step 3 in Coffee Real Estate’s home seller’s advantage is targeting the ready, willing and able buyers. Targeting the correct home buyer is key to selling your home for the most money quickly. Letting the maximum number of ready, willing and able buyers who desire your home know about it at the right time is the art of marketing. Coffee Real Estate devotes time and resources to know where these people are at given moment. This allows us to deliver the strong value message to the right home buyer. Knowing where the ready, willing and able buyers are is not a skill set most average realtors have. Also, the amount of money to find and put your marketing message in front of them is also out of reach for most realtors. Their lack of resources greatly impacts the chances of success when selling your home. 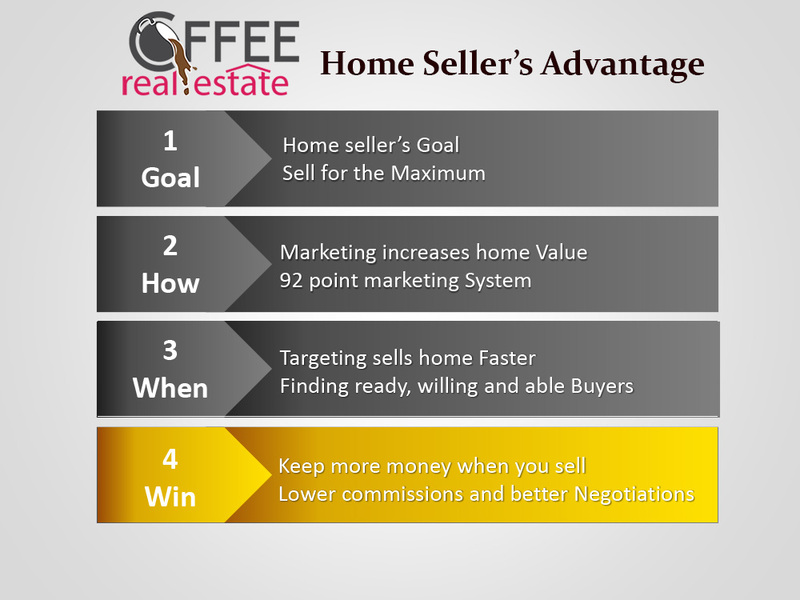 Step 4 in Coffee Real Estate’s home seller’s advantage is keeping more of the money from the sale of your property. The two key issues to keep more of the selling price is commissions and negotiation skills. There are many ways to lose money in a real estate transaction. Besides the price negotiation, the issues of concessions, repairs, give backs, fees, inspections, expectations, management and time to name a few, all impact the dollar amount deducted from the selling price. These issues can cost the property seller many more dollars than the sales commission. And if handled incorrectly, can cost the deal to fail. The common commission for selling a house is around 6%. All commissions are negotiable in California. Some do -it -yourself web sites and some brokers list for a small fee. The discount brokers and websites advertise a low starter rate. They have basic cookie cutter systems for selling your house. But they fail to add value and deal with the hard negotiations. These short comings can cost much more than a few percent commission. Coffee Real Estate offers a personalized 92-point marketing system with all the dedicated negotiations for under 2% listing commission. Ready to hear more about selling your property for under 2% listing commission? 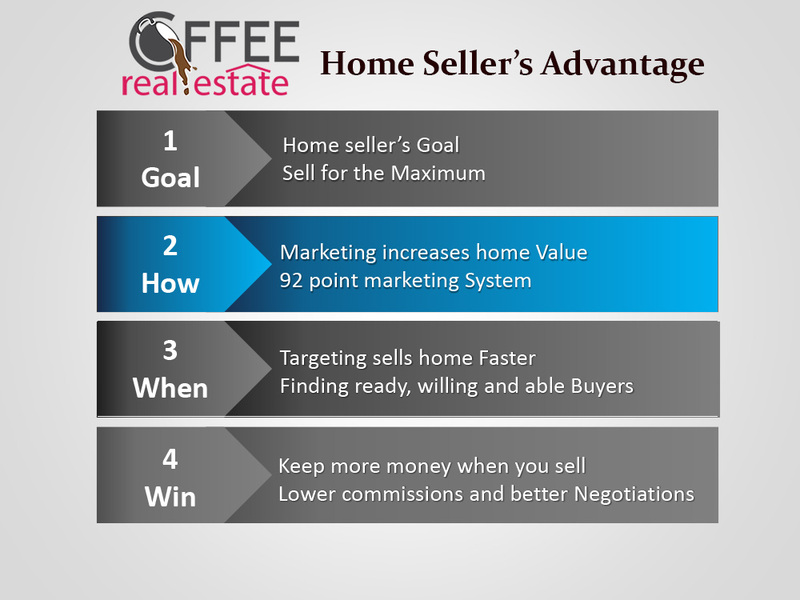 Coffee Real Estate’s 92-point marketing system is designed to give home owners the maximum dollars in the shortest time. It works fast because it is tested and ready to go on day one. Our marketing specialists are not thinking what to do, but ready to activate the powerful marketing system to sell your property. Coffee Real Estate Inc. puts its company resources behind the marketing. We use our staff and sub-contractor to design professional ads, take photos, make videos, write copy, build a web presence, syndicate your property for sale on the internet, SEO for your property web page, set up and run social media marketing including a Facebook strategy. We have the money and resources to back up all the marketing commitments. Coffee Real Estate works hard to sell your home for the maximum amount the market will bear. The home owners we represent enjoy a professional marketing campaign to sell their home quickly and for the most money. Contact Coffee Real Estate for a free, no obligation marketing analysis of your property. See for yourself how the 92-point marketing system will sell your house for more money and quicker. The difference from the standard realtor’s basic text marketing like 3 bedroom and 2 baths for x dollars marketing and a creative story telling multi-faceted effective marketing strategy is that the realtor makes your property a commodity sold at a discount. Our effective marketing plan reaches more buyers with a building value message about your home which creates more value for you. One example of how marketing makes a difference is I had a desperate client who needed to sell her worn out house fast. The standard realtors can find low ball cash buyers with lines like these - Sold “as is”, fixer or flip to make money. Our marketing focuses on the future. We can show possibilities to the buyers and grow property value for our clients. Concepts like- ready to remodel into your dream home, equity building home and ready for your style home. The other realtors wanted to short sale the home. But we sold the house before the bank foreclosure with a small profit for our client. Would you want the standard realtor’s way to sell your home? Or would you want Coffee Real Estate to build more value in your home to sell quicker and for more money for you?